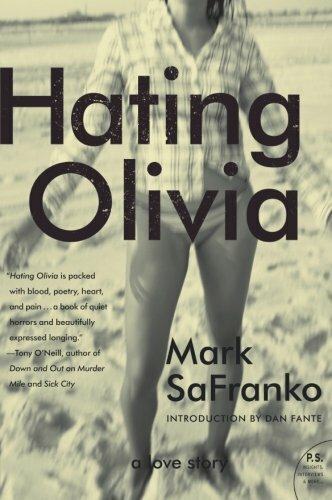 The reissue of Mark SaFranko’s powerful narrative, Hating Olivia, is proof that timing is everything. Written in a voice that echoes literary masters of the past, Olivia radiates with an identifiable, heartbreaking nostalgia that renders its effect timeless. Protagonist Max Zajack is consumed by his desire to write like the greats, to deliver something worth reading, something that will leave a stain. While working at yet another deadend job, Max meets the beautiful and mysterious Olivia. Once together, the couple finds that they share a passion for literature and writing. Things move quickly forward and within no time they are living together. Along with other wistful thinking, Olivia and Max make plans to embark on a literary journey together, with visions of spending their days writing and eventually running off to Paris to live the full and creative life they were meant to have. Weeks pass as Olivia toils as a waitress and Max’s days are spent voraciously consuming novels—though he is unable to create a single sentence of his own. It’s not long before their physically fueled obsession with each other turns dark and ugly. Without having written a word between them, the couple spirals into the depth of endless debt as reality comes crashing down, ripping through the silver lining of their unrealized—and perhaps impossible—dreams. As Max and Olivia struggle to keep a roof over their heads, the threads of love snap under the strain, and although Max is finally able to put pen to paper, he can only watch helplessly as Olivia begins to slowly unravel. Mark SaFranko is often compared to his literary hero, Henry Miller. It’s true that there are intrinsic similarities in their work, but Hating Olivia holds an honorable comparison to the work of yet another icon of literature—Ralph Ellison and his Invisible Man. Though much of the writing in Invisible Man is metaphorical, there is a scene in Hating Olivia in which, deep in debt, Max decides he must abandon his dream of being a writer and takes a corporate job with AT&T. The imagery of Max sitting at a battleship-gray desk, staring at his co-worker, prevented by management from reading or writing despite the dearth of any meaningful work and being warned that this state could continue for months, deftly sums up the corporate mindset of prohibiting productivity while fostering the inane. This is highly reminiscent of Ellison’s protagonist, who is tasked with putting a single drop of black paint into large buckets of white. Many have concluded that SaFranko is the protagonist Max Zajack, and that Hating Olivia is a memoir masquerading as fiction. It’s been written that Norman Mailer once said that all writing is fiction, which is basically due to our selective memory and point of view when telling a story; as a result, much of the truth is skewed in fiction—but not unrecognizably so. SaFranko consistently shirks any comparison to Max and reaffirms the work as fictional. However, Hating Olivia’s writing is so raw and passionate as it delves with such surety and distinctness into the mire of crippling frustration, paralyzing heartbreak, and deep self-loathing that it leaves little doubt that this experience was lived, if not just in part, then certainly in its entirety. Above all, Hating Olivia is a wake-up call to modern fiction. SaFranko has created a true piece of timeless literature, one of which the masters would have been proud. Mark SaFranko has definitely left a stain.